Introduction of .uk - Don't Do It! 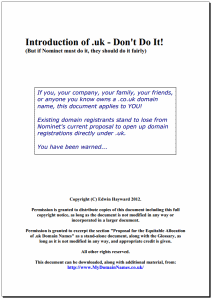 Nominet now proposes the release of .uk domain names (e.g. example.uk) for the first time. You can see the details of Nominet's proposal on their website (link opens in a new window). The introduction of .uk would have a number of consequences, and you can compare the pros and cons of the concept of introducing .uk here. .uk domains would come with added security and trust features that will not be offered to existing .co.uk registrants. This will tarnish the currently excellent reputation of the .co.uk extension, and damage over 3,000,000 businesses that rely on it for their online identity. Instead priority will be given to trademark holders. Sounds fair to you? Read here why this is a bad idea. Other countries went about the same process quite differently. In every previous case, existing domain owners were given priority ahead of other interests. Time is running out... To find out all about this issue, and how your business is likely to be affected, please download the 26-page position paper. 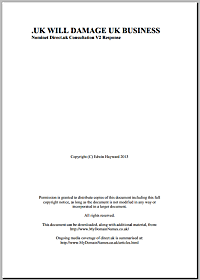 It contains detailed statistics, an overview of international best practice, and a fairer proposal for the release of .uk. Assuming you've now read the position paper, if you've not yet made your views clear to Nominet, you can still submit a response to their consultation for a limited period. It's a very detailed questionnaire, which will probably take about 30 minutes to complete. If you'd like to keep updated with new developments, you can sign up to the mailing list from the box on the right. Your email address will be kept private, and will only be used to send news and information about UK domain issues. Here's my response to Nominet's V2 consultation on .uk, which closed on September 23, 2013.